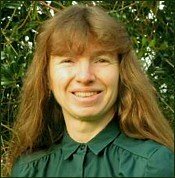 On August 27, 2009, we had the privilege of interviewing Carla Nayland, author of Paths of Exile, about an imperiled Anglo-Saxon prince. Paths of Exile was an August 2009 Editor's Choice Title at the Historical Novel Society. Relatively few novels have been written about early Anglo-Saxon England. What attracted you to this obscure period and to Eadwine's story in particular? It's a diverse and dynamic period full of drama and excitement. Bede's Ecclesiastical History may sound like a dry tome, but it's full of stories begging to be told. Eadwine's story attracted me because he led an adventurous life even by seventh-century standards, and because his wanderings took him all over Britain and from the very top of society to the very bottom. He gives me an opportunity to explore the diversity of cultures and religions and to show how ordinary people lived as well as kings and soldiers. Anglo-Saxon poems like "The Wanderer" can be very gloomy. What led you to include so much humour in Paths of Exile? The Exeter Book Riddles. Riddles describe a familiar object in a roundabout way and the listener has to work out the answer, rather like a modern cryptic crossword. Seven of the Riddles are risque "double entendres", so we have proof that the English love of the bawdy joke hasn't changed in at least a thousand years. There's also a different style of dry, understated wit in parts of Beowulf. To me, this sense of humour casts an attractive light on Anglo-Saxon culture. Jokes were as much a part of their world as the elegies. Your descriptions of the Northumbrian landscape are full of wonderful detail. Have you walked the land? Yes, I've walked all the sites in Paths of Exile on the North York Moors and in the Peak District. Sometimes the place gives me part of the story, e.g. Lilla Howe near Whitby is traditionally Lilla's burial place, so that gave me the idea that he was closely associated with that area. I've done my share of bog-trotting on the moors, so I can fully sympathise with my characters' difficulties. I can also confirm that the tors on Kinder Scout and Derwent Edge still look weird enough to conjure up thoughts of trolls when you glimpse them looming out of the swirling mists! Do the runes on the book cover have any significance? They transliterate "EADWINE REX ANGLORUM", which translates roughly as "Eadwine King of the English". Eadwine was probably the first king to rule over more or less all the area that's now England - though at the end of Paths of Exile he has a long way still to go to get there.